For political debate, the United States has its soundbites and those thirty-second commercials ending with, “I’m Joe and I approve this message.” Luxembourg’s most visible political forum consists of tidy rows of posters from the major political parties. Every time an election approaches, these temporary structures appear all over the cities and in many towns, with each party assigned a numbered space. 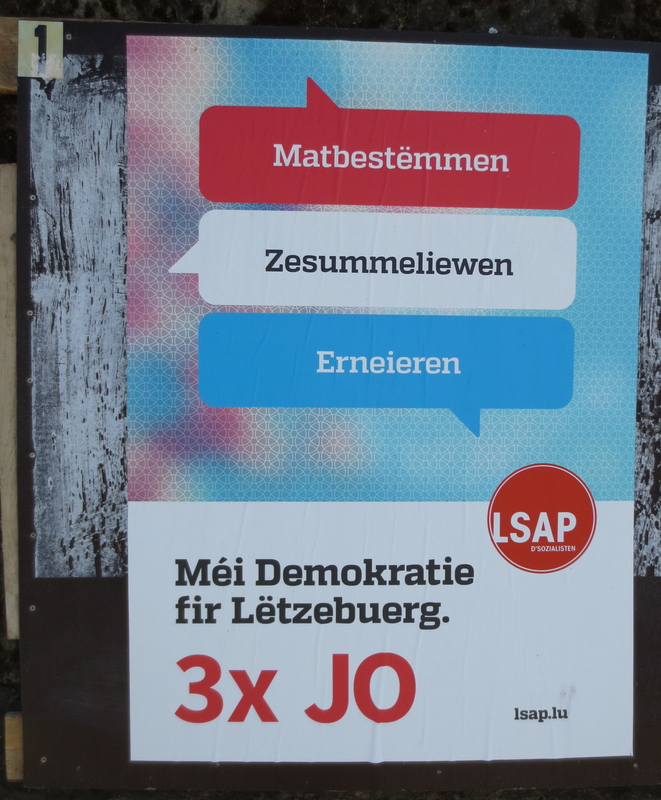 The LSAP is the democratic-socialist party of Luxembourg. In European politics, this is a mainstream position — not anti-capitalism, but in favor of balancing the power of capital with collective bargaining, as well as government regulation and welfare programs. The LSAP says “More democracy for Luxembourg, 3 times Yes.” The central symbol is patriotic, echoing the three colors of the Luxembourgish flag. The words in those three colors aren’t about the referendum. They are three principles of the LSAP: co-determination for workers, integration, and progress. Please keep in mind that I am neither an expert on Luxembourgish politics nor a competent reader of Luxembourgish! I’m puzzling my way through this out of curiosity and I very much welcome any help. The slogans at the bottom of the poster read, “Yes to youth. Yes to diversity. Yes to more democracy.” It’s no coincidence that the LSAP and DP both use the words “more democracy” — these two parties form the ruling coalition in the national parliament along with the Greens, and they decided to hold this referendum. The Christian People’s Party (CSV) would also be described as center-right, but in a very different way from the DP. The CSV is socially conservative and less committed to free-markets than the DP. In American terms, one might say “socially conservative and economically populist” — although the latter phrase doesn’t really capture the commonly held European idea that an extensive welfare state is good for conservative values. The CSV was part of the ruling coalition in Luxembourg from 1979 until 2013, and it is still the largest party. 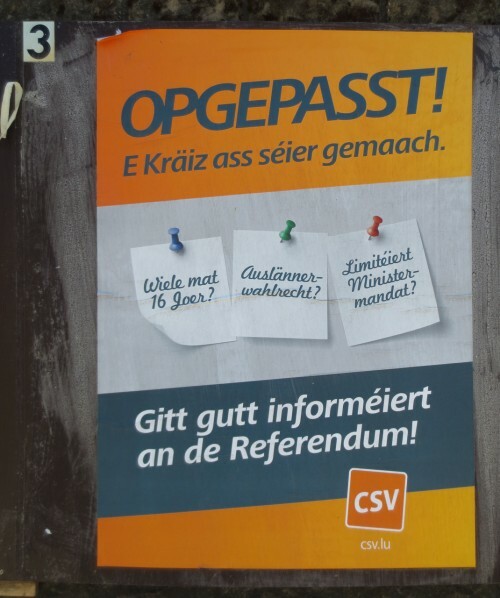 This poster makes me painfully aware of just how little I’ve learned about Luxembourgish politics (and the language). I’m certain that my description is ham-handed and misses lots of little ways that the phrases here fit into speeches given by CSV leaders and even earlier political debates. 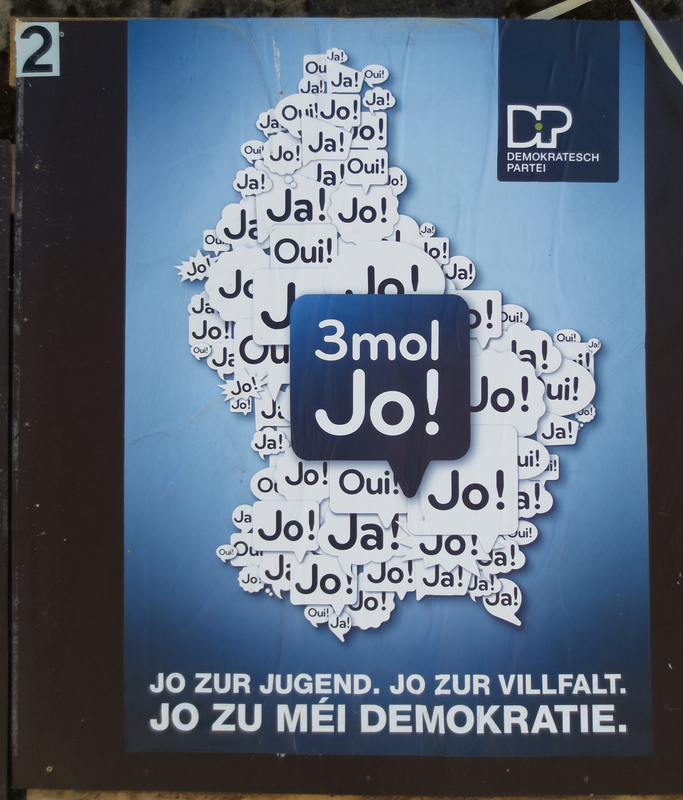 The Alternative Democratic Reform Party (ADR) is the closest thing that Luxembourg has to a far-right party, and the subject of strong opinions all over the country. Some Luxembourgers would dispute that the ADR has anything in common with infamous parties like France’s Front National. Other Luxembourgers are embarrassed by its existence and some of the more extreme (and blunt) statements of its candidates. 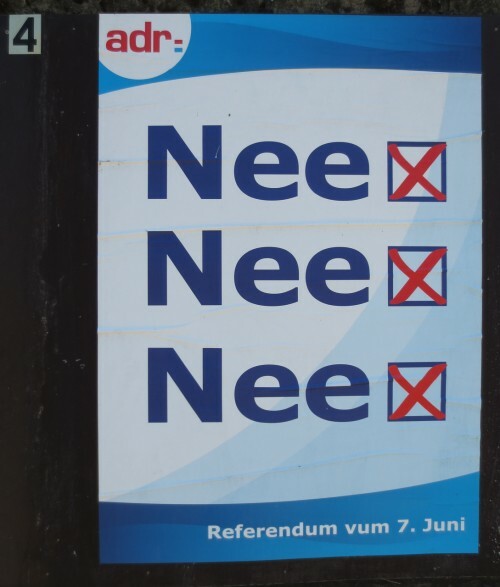 The ADR’s position on the referendum is clear on its poster: “No No No” and proudly so. Why such a vigorous rejection, especially compared to the CSV? That gets more complicated and contentious, so I’ll leave that to a more in-depth discussion, later. That’s four of the eight official posters on display, so I’ll leave the rest for Part Two! DP , LSAP , GREENS. have some reservations to overcome. not quite as ultra conservative, but still very conservative. have your background as well as your fervor but always enjoy hearing your views.